Peanut Butter is a paste or food spread made from ground roasted peanuts and palm sugar. It goes well in sandwiches with jelly or with fruit like apples, and is often used to flavor cookies and other baked goods. Peanut Butter is a good source of proteins, folate, niacin and dietary fiber. Both Creamy and Chunky versions are sold. 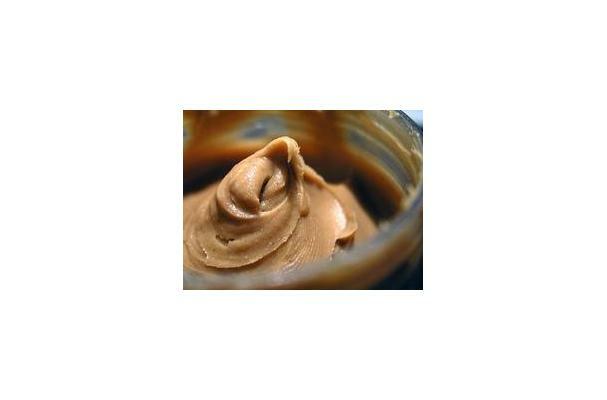 Peanut butter can be either cream or crunchy, the former being ground to a smoother consistency. It is usually very thick. Choosing: Peanut butter is available in smooth, chunky (with small bits of chopped peanuts), natural, reduced-fat, no sugar added, and even swirled with jelly for those time-challenged consumers. Procuring: Peanuts used for peanut butter are primary grown in the southern United States. They are planted in April and harvested in September and October. The peanuts are then roasted and ground into peanut butter. Peanut butter and jelly sandwiches are a popular choice among children. Peanut butter is also used to make cookies and other desserts. Many candies also contain peanut butter, surrounded by chocolate. Store bought peanut butter has a shelf life of about 1 year and should be stored in cool, dark place. Homemade peanut butter, however should be refrigerated. Many people are allergic to peanut butter. Also, there have been incidents of salmonella contamination in factories producing peanut products. History: There is evidence of crushed peanuts being eaten for centuries. The modern day origin of peanut butter is attributed to a physician who advised people to eat it for protein when they could not chew meat. The first patent for peanut butter was given to Dr. John Harvey Kellogg around 1890. C.H. Sumner introduced peanut butter to the world at the Universal Exposition of 1904 in St. Louis, and n 1922, Joseph L. Rosefield patented a smoother, less gritty version. Peanut butter evolved more over time, and Pocter and Gamble released Jif in 1958. Nice post about Foodista | Recipes, Cooking Tips, and Food News | Food: Peanut Butter. I am very impressed with the time and effort you have put into writing this story. I will give you a link on my social media blog. All the best! That's substantially I wanted to say. I don't know who does what interested. So go to the <a href=http://www.google-trade.com>Google-Trade.Com</a> and choose what you want. I hope this information will be valuable to you. To all a good day, and I'll go for a walk - the weather is perfectly simple :) Good luck for everyone.